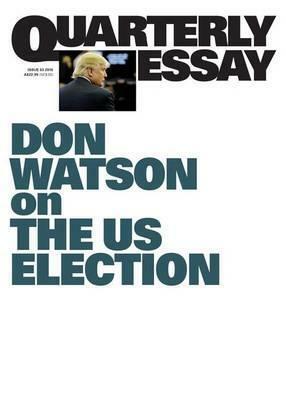 In Quarterly Essay 63, with characteristic wit and acuity, Don Watson takes us on a journey into the heart of the United States in the year 2016. Plunging into the apparent chaos of the presidential campaign and tracing America's recent past, he puts Hillary Clinton, Donald Trump and Bernie Sanders in a larger frame. He considers the irresistible pull - for Americans - of American exceptionalism, and asks whether this creed is reaching its limit. He explores alternative paths the United States could have taken, and asks where its present course might lead Australia as a dutiful ally.